Michael Monroe opened this years High Voltage festival in nice sunshine (something we didnt see much of for the rest of the day). Despite being the first band on and it still being early he managed to attract a sizeable crowd. As always Michael put in a highly athletic performance, running around the stage and then coming out past the tv cameras to get closer to the crowd (and causing the cameramen a few headaches as his microphone cable trailed across the rails the cameras were mounted on). 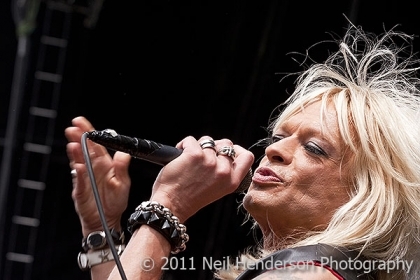 Michael Monroe is an expert at working a crowd and as always went down well with the crowd. After abandoning a brief attempt to climb up the stage scaffolding he jumped down into the photo pit before climbing on top of the crowd barrier where he stood and sang while the crowd helped support him. The set was mainly songs from the new album, Sensory Deprivation, but Hanoi Rocks fans weren't disappointed - the inclusion of Motorvatin' and mystery city going down very well with the crowd. This was the UK fans first chance to see the band since Ginger left and was replaced by backyard babies guitarist Dregen and I'm happy to say that in a live setting the change hasn't really affected things. When the next album comes will be the true test given that Ginger contributed significantly to the writing of the current album. The only negative comment is that the sound was poor and the volume was far too low, but that was a problem that affected almost all the bands throughout the weekend. 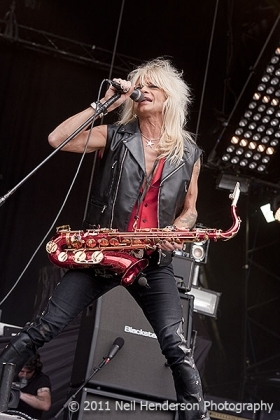 Michael Monroe will be back in the Uk on tour at the end of November and early December including an appearance at the Hard Rock Hell festival.